with the Camilia Carnation Collection and the Backyard Blossoms Collection. how they stand up tall and strong. Cut cardstock to 10” x 7”, score on the long side at 5” and fold to create a 5” x 7” side fold card base. Cut two pieces of the darker green paper from the Backyard Blossoms collection 4 7/8” x 6 7/8” and ink the edges with Vintage Photo Ink. Cut a piece of the yellow paper from the collection 4 3/4” x 6 3/4” and ink the edges with Vintage Photo Ink. Adhere one piece of green and the yellow designer paper together using dries clear adhesive and then adhere to the card base using dimensional tape. Adhere the second piece of green paper to the inside of the card. 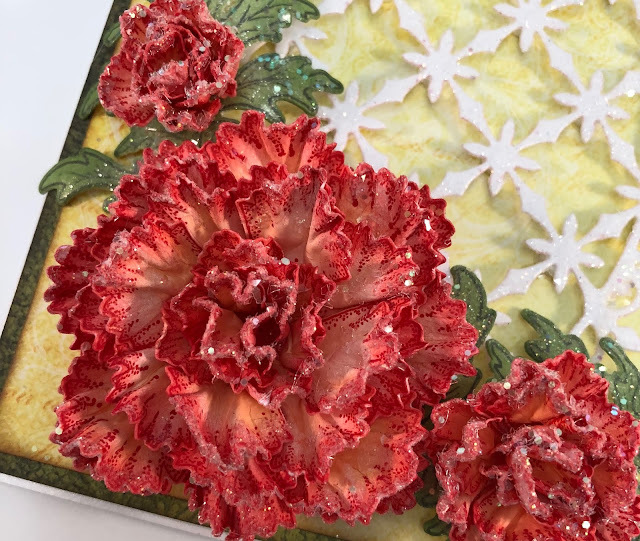 Stamp the large and small Camelia Carnations on white cardstock several times using Lipstick Red ink, diecut using the coordinating dies and color using Lipstick Red and Tangelo inks. Color the backs of each petal using Lipstick Red Ink. Place the petals in the Floral Shaping Mold, spritz with water and run through the die cutting machine. While still wet, continue shaping the petals with your fingers and the deluxe flower shaping kit. 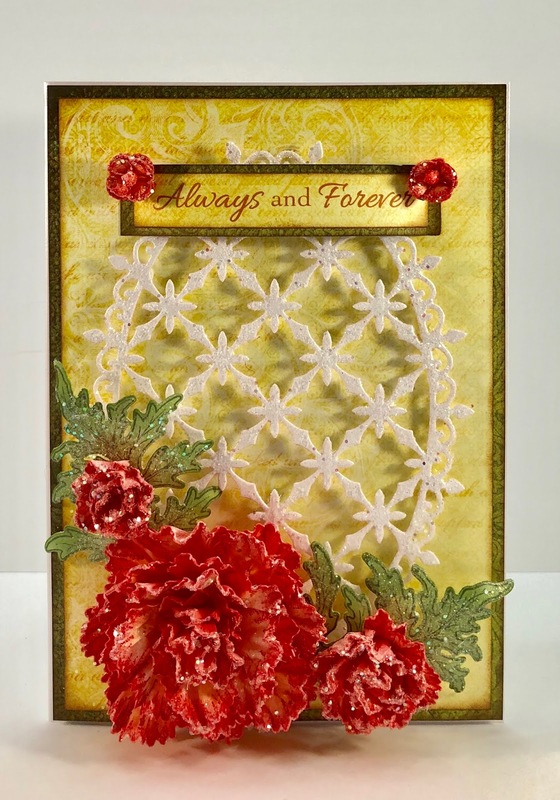 When dry, adhere the petals together using dries clear adhesive. Create one large carnation, one medium carnation and one small carnation. Also pierce holes in four of the smallest petals and add stamens to create two small flowers. 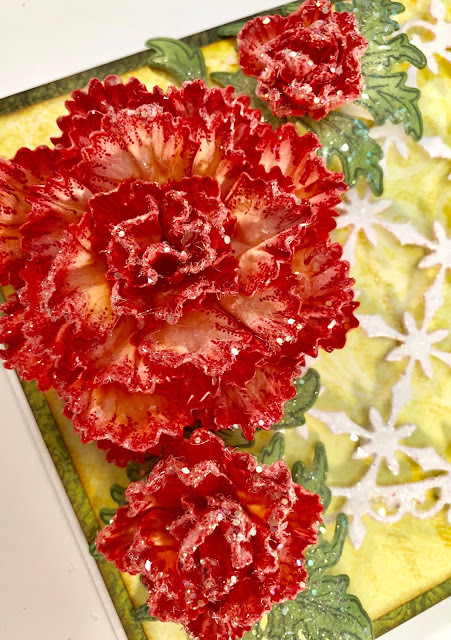 Sponge the flowers and leaves with dries clear adhesive and sprinkle with Rajni Chawla’s Crystal Clear. Adhere to the card as shown using a hot glue gun. This is beautiful! Loving all the sparkle! Oh gorgeous carnations Janet!! 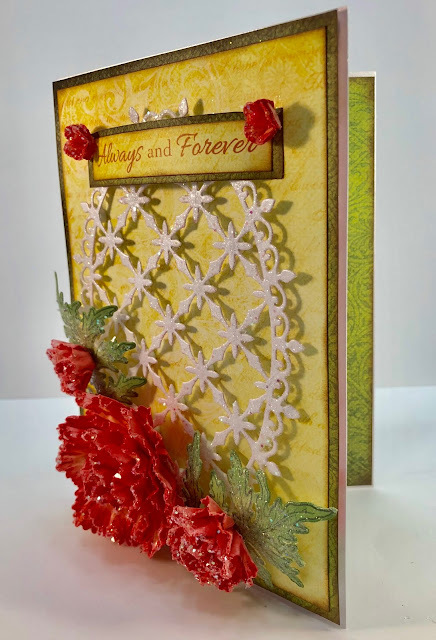 I love your card with that gorgeous oval die cut too! Beautiful! Just beautiful and I love your carnations and the colours go so well together! Absolutely stunning card! Love the red carnations, so striking!